Lopidea confluenta (no common name) is a “true bug” from the Miridae family of plant bugs and resembles the phlox plant bug (L. davisi). It has been reported to cause flower bud abortion in daylilies and iris in some areas, however no significant damage was noted in the garden where these pictures on daylily were taken. Being a true bug, it feeds by inserting a “beak” into plant tissues and therefore would not be responsible for chewing injuries. If found to cause damage significant enough to merit control, insecticidal soap may be used where the label permits. 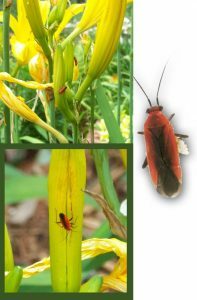 There are several other similar bugs occurring in gardens, such as the boxelder bug and milkweed bugs.